Rosemarie Rossetti, Ph.D. is a powerful, internationally known speaker, consultant, writer, and publisher who walks her talk. On June 13, 1998 Rossetti’s life was transformed when a 3 1/2 ton tree came crushing down on her. Her life was changed in that instant! Paralyzed from the waist down with a spinal cord injury, Rossetti looked deep within herself and found new strength and new resolve. In her keynote speeches, she shares the lessons she has learned since that fateful day, and demonstrates how to rise above misfortune and live life with conviction. Rossetti is the president of Rossetti Enterprises Inc., founded in 1997, www.RosemarieSpeaks.com and Fortuna Press LLC, founded in 2003. She is a member of the National Speakers Association, and served on the board of directors for the NSA Ohio Chapter from 1998-2003. Rossetti and her husband, Mark Leder, are on a personal mission to increase the awareness and discussion of the home of the future. They built a national demonstration home and garden in Columbus, Ohio, the Universal Design Living Laboratory www.UDLL.com. This home is the highest rated universal design home in North America earning three national certifications. It received a Silver LEED certification from the U.S. Green Building Council and a Gold rating on the National Green Building Standard program. 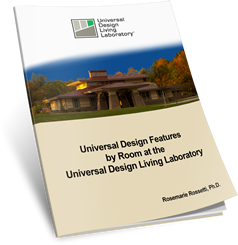 Rossetti brings the discussion about marrying universal design, green building, healthy home, and technology to the forefront. This home serves as their residence, but also is being used to inspire residential and commercial builders, architects, landscape architects, designers, interior designers, manufacturer’s representatives/distributors, and home buyers. The 3,500 square foot ranch-style home incorporates the finest craftsmanship and state-of-the-art products and services. 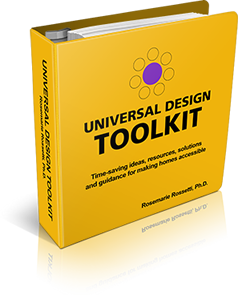 She is a Certified Living in Place Professional and is a member of the Board of Directors of the Global Universal Design Commission, Inc.
Rossetti delivers motivational programs on the topic of universal design and green building. Her keynote, Designing & Building Sustainable Homes that Make Life Easier has been delivered internationally. She and her husband consult with builders, designers and consumers assisting in the design of new and remodeled homes. Using her extensive research and first-hand experience as a person who uses a wheelchair, Rossetti writes articles for national publications and speaks internationally about the features and benefits of universal design and green building. From March 2006 to June 2011, her columns about accessible housing were published in Action Magazine, a publication of the United Spinal Association. She has also written magazine articles for Ultimate Home Design, SpeciaLiving, PN Magazine, New Mobility, NAHB's 50 Housing, Columbus Monthly, and Ability Magazine. The National Association of Home Builders, New York School of Interior Design, American Society of Interior Design, Rensselaer Polytechnic Institute, Construction Specifications Institute, Custom Electronic Design and Installation Association, Ohio Department of Aging, Ohio House of Representatives, Ohio Housing Finance Agency, Ohio Community Development Corporation Association, Building Industry Association of Central Ohio, Home Building Association of Greater Grand Rapids, Hospitality Design Expo, Design Arts Seminars, U.S. Department of Justice, and The Ohio State University have utilized her universal design and green building expertise and speaking talents at recent programs. Her radio interviews on universal design and green building have been featured on Blog Talk Radio and Builder Radio. Rossetti’s motivational program Just Like Riding A Bike: Coping with Change and Dealing with Adversity is a transformational experience. Rossetti uses the lessons that she learned during her spinal cord injury recovery to empower participants. She focuses on what motivates people to change their behavior, awaken their inner gifts, find meaning in their lives, and accomplish more to bring out the best in themselves. As a result of this program, participants will be revitalized and recharged. They will leave with restored hope, happiness and an improved vision of their future. Rossetti helps people achieve goals and take charge of their lives. She brings a positive attitude to life that touches all who hear her, with an emotive speaking style that makes audiences fall in love with her and rally to her message. Rossetti developed Selling Disability Income Insurance with Conviction using her case study. In this program Rossetti discusses the value of disability income insurance and motivates insurance professionals and financial planners to sell more policies. Rossetti was selected as the national spokesperson for disability insurance by the LIFE Foundation in 2011. Rossetti wrote a monthly nationally distributed inspirational column from December 1999 to August 2008. Rosemarie is the author, co-author or contributor to 14 books including "Take Back Your Life!" a collection of 20 inspirational articles from her columns. In December 2014, Rossetti received a proclamation from the Ohio Senate that honors her achievements. In October 2014, Rossetti received the Unsung Hero Humanitarian Award in New York City from the People of Distinction Foundation. In February 2008, Rossetti was honored as one of “20 Outstanding Women You Should Know” in central Ohio. She was selected as a national “Roll Model” on the runway in a New York City fashion show on February 6, 2007 for a spinal cord injury fundraiser sponsored by Discovery through Design. She holds the title, Ms. Wheelchair Ohio 2004. In 2002, she carried the Olympic torch in Columbus, Ohio on its way to the Winter Olympics. She also received the Remarkable Women Award and a service award from the National Speakers Association, Ohio Chapter, in 2002. In August 2001, she founded the Rosemarie Rossetti Spinal Cord Research Fund at The Ohio State University. In 1999, she received the Woman Business Entrepreneur of the Year Award; Franklin Park Conservatory – Recognition of Service Award - Board of Trustees; and the Women in New Growth Stages – Women Honoree Award. The Ohio State University College of Agriculture gave her a teaching award in 1995. Professional speaker, writer, publisher and consultant, Rosemarie presents internationally to audiences from ten to several thousand. Enthusiastic, warm, and empathetic personality, Rosemarie draws the listener into her message and develops a following wherever she goes. Together with her husband, she built the Universal Design Living Laboratory, national demonstration home and garden. Experienced educator with a Ph.D. in Agricultural Education from The Ohio State University, Rosemarie taught courses in teaching methods, oral expression, and marketing for 15 years. Undergraduate horticulture major from OSU. Rosemarie was a horticulture instructor for three years, a Certified Interior Horticulturist, and wrote for national gardening publications. Rosemarie worked eight years as an interior horticulturist. Comprehensive sales and marketing background, Rosemarie has several decades of experience as the owner of her own successful speaking and consulting business. Experienced in generating extensive and ongoing press and media exposure. Published and authored Take Back Your Life! Published and co-authored The Healthy Indoor Plant. Featured author in six anthology books: Mission Possible! ; Flowers Are Forever; Flowers Are For Love; Enabled in Words, Dancing through Life with Guts, Grace & Gusto; What Can I Do. From March 2006 to June 2011, her columns about accessible housing were published in Action Magazine, a publication of the United Spinal Association.